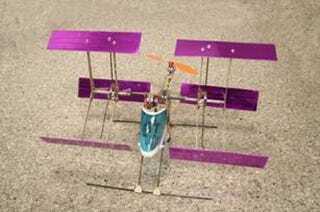 Researchers in Singapore have demoed a flying model that uses a strange paddle-wheel-like propeller design that was first patented in 1893. The cyclogyro's flat whirling propeller-blades look like the comical contraptions built in the years before and after the Wright brothers flights, but could potentially be more efficient and quieter than those currently used on aircraft. Lim Kah Bin and Hu Yu's model was developed as a sideline to their research on artifical flapping wing technology and flies whilst thethered to a power supply, as you can see in the video—apparently the first recording of a cyclogyro in flight. Other groups are working on similar cyclogyro devices, but the group at the National University in Singapore is considered to be leading the field. Their cyclogyro flyer is currently somewhat unstable, and requires the tether to keep it in place as well as for delivering power to its electric motors, but they are working on a tail rotor to help this.